The Sunrise Rotary Club of Plattsburgh has an ongoing financial commitment to the ShelterBox organization to provide aid to victims of disasters wherever they happen. ShelterBox delivers emergency shelter and other lifesaving supplies to help families begin to rebuild their lives after losing their homes and possessions following a natural disaster or humanitarian crisis. Each ShelterBox is custom-packed depending on the needs of those affected by the disaster but often contains a family tent, water filter, blankets, cooking and eating utensils, tools, children’s activity pack, mosquito net and other items. Since ShelterBox was founded, it has responded to over 240 disasters and humanitarian crises in more than 90 different countries and provided emergency aid for well over one million people. The ShelterBox solution in disaster response is as simple as it is effective. ShelterBox delivers the essentials people need to survive and begin to rebuild their lives in the aftermath of a disaster. 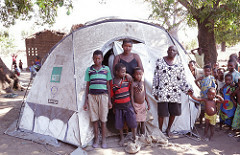 ShelterBox aid is tailored to a disaster but typically includes a disaster relief tent for a family, thermal blankets and groundsheets, water storage and purification equipment, solar lamps, cooking utensils, a basic tool kit, mosquito nets and children’s activity pack.